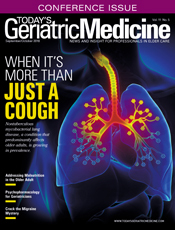 Even in the absence of disease, aging takes a toll on lung function. The muscles supporting the diaphragm weaken, making inhaling and exhaling more difficult. The structure of the rib cage can become altered, giving the lungs less room to expand. Due to neurological changes, the lungs may not take in adequate oxygen or expel enough carbon dioxide. Some lung structures can become less elastic, while an increasingly weakened immune system can make them more vulnerable to illness and infection. In addition to experiencing the breathing difficulties brought about by normal aging, approximately one in seven older adults is affected by lung disease. Not only do the risks of developing lung disease rise due to the normal changes that come with age, older adults are also more severely afflicted when they do acquire lung disease. While many suffer from sarcoidosis, respiratory distress syndrome, and idiopathic pulmonary fibrosis, clinicians more routinely diagnose and treat patients with the most common of lung ailments: emphysema, chronic bronchitis, and asthma. While that triad of conditions gets the lion's share of attention, less well recognized is nontuberculous mycobacterial lung disease, which targets older adults predominantly and is especially likely to strike those with such underlying lung diseases. In this issue's cover story, "When It's More Than Just a Cough," the authors guide clinicians in recognizing vulnerable patients. Also in this issue, a dietitian looks at "Malnutrition in the Older Adult." She discusses the findings of the Malnutrition Prevention Commission, whose mission was to improve the health of older adults in Ohio by reducing the incidence of malnutrition—the leading cause of morbidity and mortality in the geriatric population. In the United States, as you'll read in "Crack the Migraine Mystery," migraines are more common than diabetes and asthma, affecting 38 million Americans, many of them older adults. The article addresses the primary challenges of diagnosing migraines as well as prevention and treatment strategies. The final feature in this issue spotlights another topic with broad appeal, psychopharmacology in older adults, examining the medical options for the treatment of depression and anxiety as well as their side effects and unique influences on older adults. It's part of a critical conversation since more of these drugs are being prescribed by primary care physicians than by psychiatrists.